(Photo: Dr. Catherine Crosby, La Jolla Institute for Allergy and Immunology) Increased iNKT activity has a protective effect on asthma. 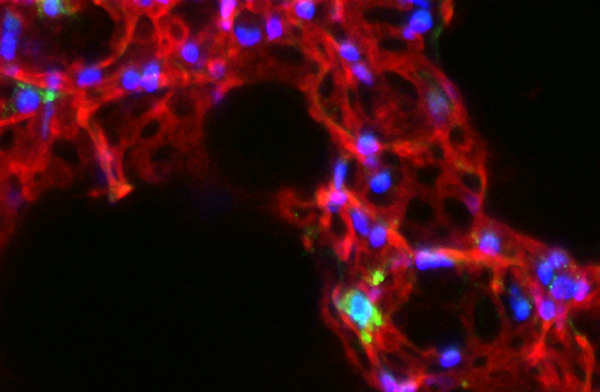 iNKT cells (green) in lung vasculature (red). Cell nuclei are shown in blue. LA JOLLA, CA—Asthma is a chronic inflammatory disease driven by the interplay of genetics, environmental factors and a diverse cast of immune cells. In their latest study, researchers at La Jolla Institute for Allergy and Immunology (LJI) identified a subset of T cells, whose frequency serves as early childhood immune signature that predicts the risk of developing asthma later on. The study, published in this week’s online edition of the Journal of Immunology, was part of the larger Urban Environment and Childhood Asthma (URECA) study funded by the National Institutes of Health. Initiated in 2005, the study follows 560 families from four disadvantaged urban areas who are at high risk for asthma to uncover potential risk factors that contribute to increased asthma rate in children growing up in impoverished neighborhoods. Postdoctoral researcher and co-first author Shilpi Chandra, Ph.D., and her colleagues were particularly interested in MAIT cells (short for mucosal-associated invariant T cells) and their brethren, invariant natural killer T (iNKT) cells. Both cell types are an integral part of the innate immune response, which reacts almost immediately to foreign invaders. Unlike conventional T cells, which belong to the adaptive arm of the immune response and take a few days before they are fully trained on a single, specific protein fragment or peptide antigen, MAIT and iNKT cells recognize molecular components common to many microbes. The team analyzed the frequency of different types of immune cells in blood collected from 110 one year-old study participants, the presence of immune-stimulatory components in the subjects’ house dust and asked whether any of the factors correlated with an increased of asthma at age seven. And while the absolute numbers of iNKT cells had no bearing on asthma risk, the iNKT cell antigenic content in house dust from subjects’ houses did. “iNKT activity reflects a home environment with increased microbe exposure and therefore protection from asthma,” says Shilpi. The study was funded in part by the La Jolla Institute for Allergy and Immunology, the National Institute of Allergy and Infectious Diseases, the National Institutes of Health and the Department of Health and Human Services Grant R37 AI71922 and under Contracts NO1-AI-25496, NO1-AI-25482, HHSN272200900052C, HHSN2722010000521, 1UM1AI114271-01, and UM2AI117870. Additional support was provided by Grants 5T32AI007007, RR00052, M01RR00533, 1UL1RR025771, M01RR00071, 1UL1RR024156, 5UL1RR024992-02, and UM1 AI114271.